A covering, usually made of vinyl, for the walls and floor of a swimming pool, used to keep the water in and protect the pool's surface. 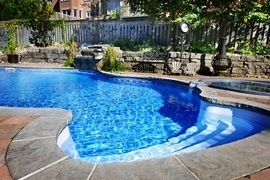 Pool liners provide a clean look, and they also come in a variety of designs, allowing the owner to express their style. Vinyl liner pools can cost over $10,000 less to install than fiberglass or concrete pools. The liner must be replaced every 5-9 years, at a cost on average of $4,000, meaning they may not be cheaper in the long run.